Open air model grilles provide security while allowing full visual access and air circulation. Full closure models provide visual access in most cases and enhanced security by preventing pilferage through openings. Applications include shopping malls, convention centers, schools, garages and other institutional, commercial and retail projects. Side-folding grilles are available in open air and full closure models and feature multiple styles, patterns and colors. Open air models grilles provide security while allowing full visual access and air circulation. Full closure models provide visual access in most cases and enhanced security by preventing pilferage through openings. Applications include shopping malls, convention centers, schools, garages and other institutional, commercial and retail projects. Side-folding grilles are available in open air and full closure models and feature multiple styles, patterns and colors. Rolling grilles are also available in open air and full closure models. Open curtain, which allows air circulation, is formed with a series of horizontal rods 5/16"in diameter. Vertical O.C. separation between rods is 2". Rods are available in aluminum -mill, clear or color anodized finish of alloy T5056 H32, solid stainless steel -polished 300 series, or solid galvanized steel. Vertical chains are formed of eyeletted aluminum or stainless steel on 9", 6", or 3" centers. End chains are held in place by double E-rings on horizontal rods on both sides of chain to retain curtain ends in guides. Sizes: Openings up to 40' wide x 20' high standard, consult factory for larger sizes. 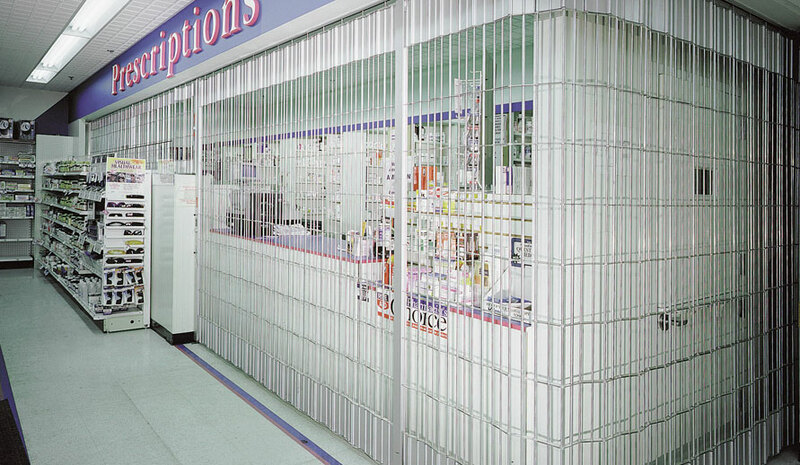 Rolling Grille Benefits: Security: Grilles prevent unauthorized access and discourage forced entry at building exterior openings, storefronts or areas within buildings, such as pharmacies or parts counters. Used behind plate glass storefronts, they are a deterrent to smash-and-grab crime. -Aesthetics: Curtains are available in either a straight (CESG10) or brick (CESG12) pattern in a variety of metal finishes from polished stainless, anodized aluminum, to dark bronze anodized. Adding beauty as well as security to the interior or exterior of a building. -Design Flexibility: Clopay grilles are built to order to fit your opening size, operation and option preferences. -Early Installation Option: Early/easy self-supporting installation system lets grilles be fitted in before walls are built and before there is an opening. Structural tubular members, factory machined and fitted for grille guides and brackets, attach directly to the slab below and joists above ensuring proper fit and function of the grille unit. -Space-saving: Curtain stores in a compact coil at the head of an opening to maximize the use of the interior space. Operation: Push-up, hand crank, hand chain (face of wall mounted exposed guides only) and motor operation. Standard push-up operation is acceptable for grilles under 10'-0" in height or widths less than 16'-4". For wider grilles where push-up operation is desired, see the EZ Lift Option below. High Cycle Springs: If a grille is expected to operate more than 5 cycles per day, special high cycle construction is appropriate and is offered on the Model CESG12 Brick Pattern Grille. Early Installation Option: Guides are supported with either structural steel tubes or wall mounting angles. Using structural steel support tubes allows for installation prior to the walls being built. The tubes can be factory prepped for the attachment of all grille components. Tubes are attached to the slab below and the joists above, thereby becoming self-supporting. EZ Lift Push-Up Package for Wider Grilles: The EZ Lift package allows push-up operation on aluminum grilles up to 22' wide by 10' high. This results in added savings in initial costs and long term maintenance for building owners. Consult us for applicable sizes for stainless and galvanized steel Glazed panel Grille (CERG11) series. Manual Release System: For use with motor operated grilles, this Manual Release system is utilized to meet building code emergency egress requirements. A wall mounted pull handle disengages the motor drive, which allows the grille to automatically open part way for egress. Releasing the pull handle resets the grille to normal operation. An option available for increased protection from theft of small articles through the curtain, the Clopay Glazed panel grille is constructed of clear 12" x 3", 1/8" thick Lexan¨ (or equal) panels. The flame retardant poly carbonate panels are secured by bronze color molded nylon links attached to 5/16" diameter solid aluminum horizontal rods of alloy 5056 H32, creating a barrier against refuse, odors and smoke. Horizontal 5/16" diameter solid aluminum rods at 2" centers. Rods supported by heavy duty aluminum links, held in staggered position by tube spacers throughout the entire curtain assembly. Available in aluminum - mill, clear, or color anodized finish in alloy T5056 H32. High cycle construction (high cycle shaft and springs) available. Rolling Grille Benefits: -Security: Grilles prevent unauthorized access and discourage forced entry at building exterior openings, storefronts or areas within buildings, such as pharmacies or parts counters. Used behind plate glass storefronts, they are a deterrent to smash-and-grab crime. SIDE FOLDING GRILLES AND CLOSURES PROVIDE SECURITY AND ACCESS CONTROL IN OPENINGS TO 12' HIGH WITH LOW HEADROOM CONDITIONS. Design: Open curtain, allowing free air circulation, formed by a series of vertical 5/16' diameter aluminum tubes on 2" centers. Horizontal chains are formed of eyletted aluminum links on 12', 9", 6" or 3" centers. A series of 6" high continuous interlocking extruded aluminum hinge panels form the top and bottom of the curtain. Track Overhead track is an extruded heavy-duty aluminum section 1 1/2" wide, 1 7/8" High. Track required for curved openings has a standard 10" radius: 90º, 120º, 135º and 150º. .
Materials & Finishes Aluminum rods, tube spacers and link chains may be mill finish, clear or color anodized. Track, end members, intermediate members and hinged panels may be clear of color anodized. Design: Curtain with glazed or solid aluminum panels create a security barrier and blocks refuse, odors and smoke. Continuous vertical interlocking aluminum pivoting sections are set on 5 1/2" centers. Interlocking sections are fitted with either glazing panels in clear, flame retardant 1/8" thick polycarbonate material, G.E. Lexan or equal; or solid aluminum panels to deny visual access. Panels run full height between 5 1/2" high extruded aluminum closure panels at top and bottom.